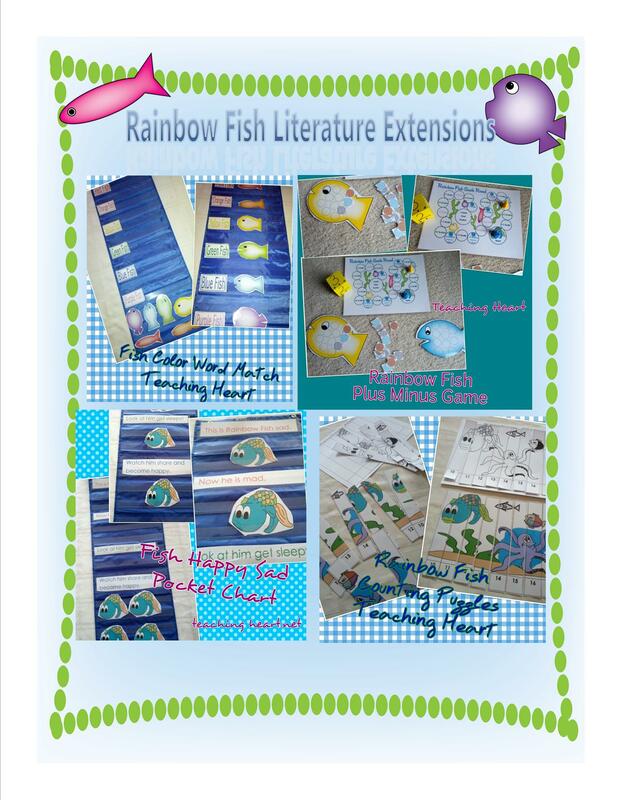 These files are suggested to be used with a Rainbow Fish or Rainbow Themed Unit. You will find games, centers, a craft, and activity sheets for math and reading. I suggest you use these with a preschool or kindergarten classroom. The skills covered are on a Preschool and Kindergarten level. 1.Rainbow Fish CD Craft Templateprint out template to easily make this fun craft. 2.Rainbow Fish Math Board GamePractice adding 1 to 3 . Practice subtracting 1 and 2. Be the first to fill your fish with 10 scales and win! 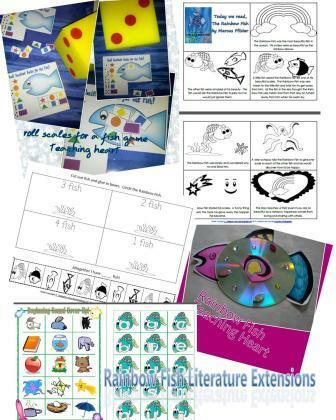 3.Rainbow Fish Emotions Pocket Chart Pieces and Independent Activity Sheet to match! 4.Roll Scales Dice GameDecorate a fish with shapes (scales). Great game for review of dice, shapes, and colors. 5.Counting PuzzlesOne in color so you can print on cardstock laminate and reuse as a center. One is black and white. Students can glue this to the given sheet and then color. 6.Fish Color Match Pocket Chart PrintablesUse during whole class instruction/ circle time. 7.Mini Bookstudents color the book and take home to use as a retelling of the Rainbow Fish story. 9.Beginning Sound Cover-UpPage 1 contains the game board for this activity. Page 2 is the letters to cover up the pictures that start with the given sound. Can be used as a center activity. Clipart for these files are purchased from: Johnston Kindergarten, Graphics From the Pond, and Krista WaldenIndividual sheets state where graphics are from. Microsoft Office was also used. Individual Sheets will state where graphics were used from.